Gas flaring, the combustion of associated natural gas produced during oil extraction, is a significant global issue. So much so that the World Bank has launched a number of programmes to tackle this undesirable activity, the latest being the ‘Zero Routine Flaring By 2030’  initiative launched in April 2015. Various indicators  point to the need for such initiatives: in 2014 around 145 billion cubic meters (bcm) was flared from a total production volume of 4306 bcm; representing $20 billion (USD) worth of fuel, or 750 billion kWh of electricity – enough to power the African continent for an entire year; the flaring of associated gas also contributes to climate change and constitutes ~1% of all anthropogenic carbon dioxide emissions (2014 data). Such flaring reduction initiatives are therefore clearly necessary. However, the question then arises: how can such initiatives be measured in their effectiveness at tackling the reduction of global gas flaring activity? One approach that shows a lot of promise involves the use of Earth observing (EO) satellite systems to detect gas flares and measure their emissions. A number of techniques have been developed and the most well-known is the NightFire  product generated from the Visible Infrared Imager Radiometer Suite (VIIRS), a polar-orbiting satellite that provides global observations of the Earth on a daily basis. NightFire detects flares using the VIIRS imaging channel located in the Short Wave Infrared (SWIR) spectral region where, as defined by Wien’s displacement law, gas flares with their 2000(±250) K [2, 3] combustion temperatures have peak radiant emissions. Once flare locations have been identified NightFire proceeds to determine estimates of flare temperature and pixel extent. It does this by attempting to fit the Planck function to observations of spectral radiance for the flare containing pixel across a range of VIIRS imaging channels from the near- (NIR) to the mid-infrared (MIR). Assuming the fit is successful, the NightFire algorithm can determine the amount of energy being released by the flare at a given time (its radiant power (in W)) by using Stefan’s law with the outputs from the Planck fitting process and the VIIRS pixel size. The radiant power being emitted by a flare is highly correlated with the combustion rate of the natural gas, and therefore with such knowledge in hand it is possible to determine flared gas volumes. Whilst NightFire is a powerful technique it has some limitations, one being that in order to effectively fit the Planck function the flare must be observed across multiple spectral channels. This requirement, particularly in the case of smaller, less radiant flares, is often unfulfilled. This leads to poorer quality estimates of the radiant power being emitted by the flare. An approach that can estimate flare radiant power using only a single channel is therefore clearly desirable. One potentially suitable technique, referred to as the MIR-Radiance method and developed at King’s Geography , is used extensively for estimating the radiant power of Landscape fires and uses single channel observations from the MIR spectral region. This powerful approach exploits the similarity in the slope (see Fig. 1) of the Planck function and Stefan’s law over Landscape combustion temperature ranges (600 K – 1300 K) at MIR wavelengths. The shared behaviour of the two functions over this wavelength and temperature range combination permits mapping from the observed fire spectral radiance (Planck function output) at MIR wavelengths directly to the radiant emittance over all wavelengths (Stefan’s law output). In short we can estimate the radiant power of a landscape fire directly from observations of MIR spectral radiance. It would be highly desirable if such an approach were applicable to gas flares, and it turns out that it is entirely possible – you just need to find the appropriate wavelength in which to observe the gas flare. The key requirement of the MIR-Radiance method is that the Planck function and Stefan’s law show similar behaviour (i.e. slope). For Landscape fires, which burn between 600 K and 1300 K this occurs at MIR wavelengths, but gas flares burn hotter, around 2000 K, and therefore we need to shift* to the SWIR spectral region to preserve the special relationship between the two functions (see Fig. 1). With this change in spectral channel we can estimate the radiant power of gas flares directly from observations of SWIR spectral radiance. Figure 1. 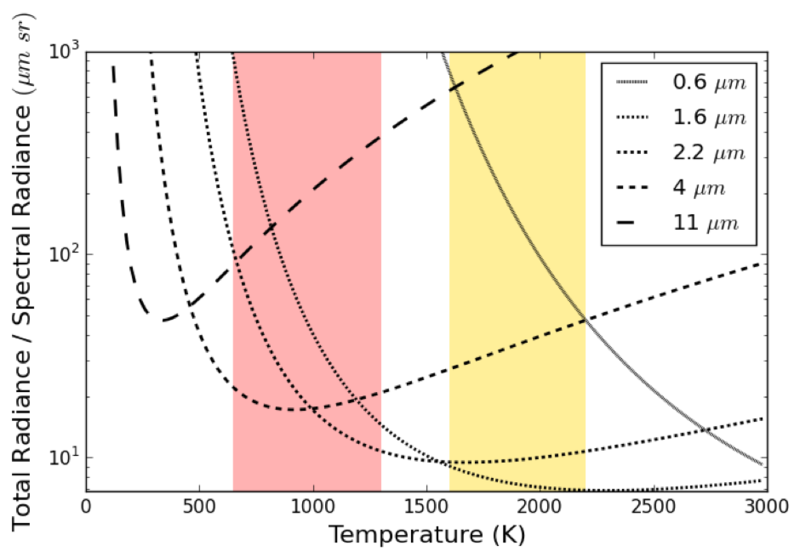 Ratio between Stefan’s law (Total Radiance) and the Planck Function (Spectral Radiance) as a function of common wavelengths used in EO satellites and temperature. Where the slope is approximately constant provides indication that the two functions show similar slope, and that is is possible to map from spectral radiance to total radiance using a constant factor. The area demarcated in red indicates Landscape fire combustion temperatures and the yellow area gas flare combustion temperatures. The applicability of this method is shown in Fig. 2, where ~60,000 gas flares observed by NightFire are also evaluated using the single channel SWIR method. Excellent agreement is demonstrated [0.49 ± 1.6 MW]. This single channel approach, given the reduced technical requirements of the algorithm, will allow the processing of other, longer term EO datasets (e.g. ATSR, which spans 1991-2012) providing an excellent opportunity to assess the efficacy of gas flaring reduction initiatives such as those introduced by the World Bank. This work was presented at the EOES hub meeting on the 13th April and carried out under National Centre for Earth Observation (NCEO) funding. Figure 2. NightFire vs. SWIR comparison. Left plot is the comparison between the retrieved radiant power from the two different algorithms over ~60,000 gas flares observed during the months of February and September 2014. The missing x-axis is the NightFire radiant power (MW). The right hand map shows the location of the flaring sites using in the comparison as red points. * For those interested you can see why this shift is necessary by taking the derivative of the Planck function w.r.t. temperature. Then at the at the temperature that results in peak radiant emission for any given wavelength (as defined by Wien’s law) the slope of this derivative is defined by a fourth order power law, i.e. equivalent in form to Stefan’s law. As such, if we know the combustion temperature of the feature of interest, we can determine, using Wien’s law, an appropriate wavelength for estimating total radiance directly from spectral radiance. For a gas flare at 2000 K we get from Wien’s law that 1.45 µm (i.e. in the SWIR spectral region) is the optimal observing wavelength for single channel radiant power estimation. “Zero Routine Flaring by 2030.” World Bank. N.p., n.d. Web. 23 Apr. 2017. <http://www.worldbank.org/en/programs/zero-routine-flaring-by-2030>. Elvidge, C.D., Zhizhin, M., Hsu, F.C. and Baugh, K.E., 2013. VIIRS nightfire: Satellite pyrometry at night. Remote Sensing, 5(9), pp.4423-4449. Reed, R.J., 1986. Combustion handbook. North American Mfg. Co., Cleveland, OH. Wooster, M.J., Zhukov, B. and Oertel, D., 2003. Fire radiative energy for quantitative study of biomass burning: Derivation from the BIRD experimental satellite and comparison to MODIS fire products. Remote Sensing of Environment, 86(1), pp.83-107. This entry was posted in Earth Observation by Maha Mirza. Bookmark the permalink.